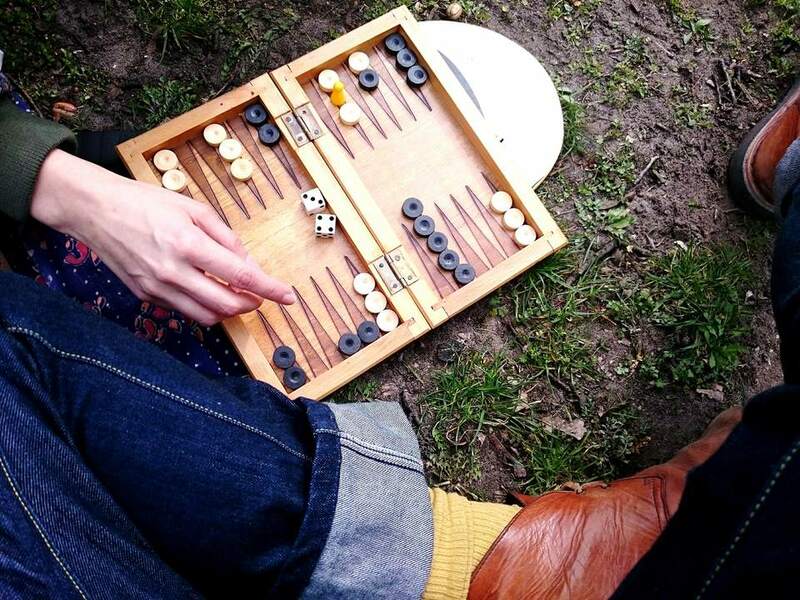 Backgammon is one of the oldest board games, originating more than 5,000 years ago. It's a two player game, with the object of the game to be the first player to "bear off" or move all 15 playing discs, or checkers, off the board first. For casual backgammon players, it's easy to forget how to set up the board if you play infrequently. Follow these instructions and you'll have it set up and ready to play in no time. Backgammon set up is simple and can be done in 5 minutes or less. While backgammon sets come with large round black and white discs, it's fine to substitute checkers, tiddlywinks, or even quarters and nickels in a pinch. Like many other well-established games, backgammon has its own set of names for pieces and parts of the board. Get to know the terms so you'll be ready to play against anyone! The 24 triangular areas on which the discs are initially placed and across which they move are called points. The home board is the half that includes both players' home areas (this could be on your left or your right, depending which color you're playing). The other half is the called the outer board. The bar separates the home board from the outer board. Set the board on a level playing surface between the two players. Count the playing discs to confirm that you have the correct number. There should be 15 each of two colors, for a total of 30. If you're playing a more serious game, you might use a doubling cube, but it has no impact on the initial setup. Decide which player will use which color. Determine prior to starting gameplay if you will be using a doubling cube or other more advanced gaming techniques. It doesn't matter which side is designated the home board and which is the outer board, but both players' home boards, and therefore their outer boards as well, are on the same side. Place five discs of your color on the point closest to the bar but within the home board on your side. Your opponent should do the same on his side. Place two discs of your color on the point farthest from the bar and within the home board on your opponent's side. Your opponent should do the same on your side. Place three discs of your color on the second point from the bar and within the outer board on your side. Your opponent should do the same on his side. Place five discs of your color on the point farthest from the bar and within the outer board on your opponent's side. Your opponent should do the same on your side. A doubling cube can be used to speed along the gameplay and add an additional element of strategy to the game. The Backgammon doubling cube looks like a regular die, but it is a little larger and it has the numbers 2, 4, 8, 16, 32 and 64 printed on its faces. It can be purchased at a game store or online. The doubling cube allows the players to double the value of the game. Advanced players may use "beavers" which enable players to redouble, or double the value of the game again.